Justina Robson is, as her website so rightly says, an author from Leeds in Yorkshire, England. 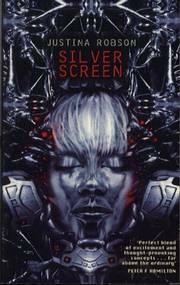 Silver Screen, Justina's first published novel, hit the mean UK streets in 1999. 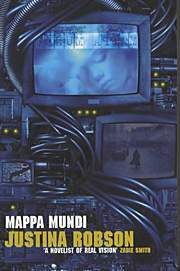 It was a smart, sympathetic and subdued book that caught the eyes of a number of people in dealing with the plight of sentient Artificial Intelligences in the near future, and was rightly short-listed for the 1999 Clarke Award and the British Science Fiction Association Best Novel Award. Her next novel, Mappa Mundi, dealt with nanotechnology and social engineering and was short-listed for the Clarke Award in 2001. As if this wasn't enough, once again, Justina was shortlisted for the Best Novel of 2003 in the British Science Fiction Association Awards with Natural History, and the book came second in the 2004 John W. Campbell awards. A skilled piece of grandstanding space opera, Natural History mixed a whole slew of themes and big ideas in a significant piece of work whose undoubted stars were the equally remarkable Forged, artificially grown and enhanced (both biologically and cybernetically) animals who now roam the solar system. Stir in some ghost worlds, advanced races of god-like aliens and a thoughtful, but fun, storyline and you have one of the best books of last year, and the continuing development of an ever-growing talent who continues to produce increasingly important work in the genre. 1. Hello, Justina. First of all Natural History struck me as quite a big leap away from Silver Screen and Mappa Mundi in terms of scale and the number of ideas, if not in concepts. Were you consciously setting out to write something bigger, or at least different to your previous novels? I was setting out to write something that was simpler and more fun. The research and plotting effort I put into the first two was enormous and I'd just come off this steep learning curve and was feeling like I needed a holiday from that kind of thing. So I decided I was going to splurge and have everything I had never managed to get out of the Big SF Supermarket before -- big spaceships, intergalactic conflict, spooky lost worlds, hive minds, groovy biotechnology, ultra-alien aliens...the whole nine yards. I didn't think about storylining it until I'd written about half the sections and invented the Forged and found all the places they were going to get to. Writing it was as easy as falling off a log really. It has a very straightforward story at its core, around which everything else revolves. I think Natural History is much the simplest book I've written and perhaps the most effective. 2. Having now "broken out" into interstellar space, do you think you'll find it difficult in future going back to events on just one planet? No, but I might find it hard to write something set in just one room, for instance (although now have said that am already feeling must rise to challenge!). My next book takes place in only a few locations, but you do see them through a lot of different heads, so the variety is still there. 3. The Forged are a wonderful, even "classic", sf invention: slightly scuzzy, imperfect, but still possessed of abilities far beyond the merely (Unevolved) human. Where did the original idea for these come from? And which came first, the really big guys or the smaller ones? Thanks. I wanted to see how far you could push human and still have it count. The idea started out with Transformers however, because I always thought they were so cool. Then when I started to play around with the ideas it was soon obvious that this was going to be an AI/racism/political oppression storyline but now one in which it was very unclear who was responsible for oppressing whom. I wanted to show that the inner limits of self-belief and our own view of reality are at least as powerful as any external limitations we might experience. This varies obviously, depending on the circumstances. You can't imagine your way out of a war, but then, it's stupid to fight one that doesn't exist except in your own mind. The first Forged were the Gaiaforms. I really loved some of the weird people and machines in Banks' The Culture, especially the scale of them and I thought -- how big could you get? How would it work? What would it be like? After that I just invented a new one whenever it looked like there might be a niche they could use or a job to do. Gritter was the exception. I always wanted to write about a creature like that since I saw an image of something like him in a picture (a Jim Burns picture? Not sure) and then another incarnation of similar in Blade Runner, I think, and also in Farscape. His character appeared fully formed in the first line he ever spoke. He's relentlessly unreformable, selfish, cynical and cranky but he has this great energy which is impossible to dislike. 4. Do you not think the Animal Liberation Front and all their chums would have had a word or two to say about the initial development of the Forged? Given the state that a fair few of the Forged seemed to have ended up in in the book, I thought they could well be said to have a fair point, so would you be against their creation? Would it not perhaps be morally simpler to create the Forged from human volunteers? No. It's not the Island of Dr Moreau, you know! They're more 'made in vats by chemists' rather than 'spliced together by insane scientists'. The book I'm outlining now will go some way to showing how they got made. As I hope I'll show, it was never a clear-cut case of should and shouldn't when they came on the scene. More would and wouldn't, can and can't. As for the human volunteers -- no shortage of those, I think. Look at Frank Borman, James Lovell, and William Anders, who were the first people to sit on top of a Saturn 5 and experience 1.5 million pounds of thrust. As it is though, I think that the beginnings of the Forged are much murkier and less obvious than rocket building. Although there are moral issues, they're not clear cut ones. "there are few heroes and villains here; life isn't that straightforward, and the reader often feels more drawn to a character whose background would normally bear a flag saying 'evil' than to a freedom-seeker." There were few "Good" or "Bad" characters, but rather everyone had some good and some evil in them, in varying amounts, which was, sadly, still unusual enough to merit comment. Was this a deliberate, conscious effort on your part to make them thus? The attachment to a view of good and evil as a plain either/or binary bit label is, as you imply, an immature view of the world. Anyone who has been paying attention knows that all of us are constellations of impulses which come in varying degrees of good-for-us and good-for-others. In fiction, we can choose to go back and relax in a clearly painted bipolar world for escapism if we want to, but I've found this view of the world has lost its ability to offer me even that. I don't want to escape for one thing. I want to understand reality better than I do. So when I write I always try to reflect what I think is the truth of a character -- and we're all conflicted, over little things and over big things -- and we all want to do better -- and we all want the same things really, but we don't have the same ideas about how to get them. Bad consequences flow from good intentions and vice versa. We are poor assessors of consequences; we have no real control over anything except the interpretation of our actions and sometimes the actions themselves, although we must take responsibility. It's very hard, and good and evil are concepts that aren't robust enough to cover it in their blanket forms. When they're deployed as labels on entire complex systems (people) they get in the way of real feeling and real thinking -- they're prophylactics against sensitive analysis. In that form, I haven't got any time for them. 6. The cover of Natural History is one of the most striking and beautiful I've seen for a while. How much of a hand did you have in it? I like to think I had a hand in it, but the people who actually made it are due all the credit. Steve Stone created the image. We had a chat about what it might be. The Macmillan publisher said they wanted something brighter so we agreed that a big orange sun was quite bright and jolly. Steve asked what Isol might look like and I asked him to look in a big book of insects and combine that with some machine stuff. So that was a pretty tiny contribution from me! He did all the gorgeous visionary stuff. The cover feel and lettering were done by James Hollywell at Macmillan, and I think the foxed look was inspired. I had nothing to do with that. 7. I note (from a Cheryl Morgan interview at Strange Horizons) that you had "a stint at art college because [you] thought [you] might be able to do illustration and writing". I wondered if you had ever thought of going into comic books, or whether you are/were interested in comics, given this artistic bent? I would have loved to be a comic book artist but I think it's too late now. I have a minor talent for drawing but it's still as underdeveloped as it was when I was fifteen. I like comics very much and they have been a big influence on me, particularly the early '80s 2000AD and the X-Men. 8. And not entirely unconnected to this question: what superhero would you like to be or what superpower would you most like to have? I always wanted to grow up and be Batman. Later, I realised that maybe I didn't want to be Batman after all -- he's a vigilante and tormented by inner demons. That would be OK when I was in my early twenties but I don't fancy it so much these days. Now I think it over I realise that all my heroes were male! Not that that is a barrier in fantasyland. My favourite comic character at the moment is Mystique. I'd choose her mutant power of shapeshifting over the rest. That way, I get to be a lot more than just one thing! 9. Have any particular writers influenced you in developing your writing style and the direction you've gone in? Whose work (if anyone's) is a must-read for you today? Anything good I've ever done has been lifted from somebody else. I know that's true but I can't point to the pieces and the people and link them up any more. All writers are like that to some degree. We take old pigs and make new sausages, to mangle Dorothy Parker's famous quote. I'd always gladly read a Jon Courtenay Grimwood, Rob Holdstock or Tricia Sullivan novel, or anything by Iain Banks and Jonathan Carroll. I wait for Geoff Ryman books. I like a lot of writers a very great deal -- writers, if you didn't find your name checked here it's probably because I didn't read yours yet... I've got the Clarke list to read this year, so active choice has been suspended for now. 10. Has motherhood made it more or less difficult to write? Has it stimulated the old creative juices or stilled them somewhat? Do you find yourself thinking differently in relation to your writing now you're a mother? Well, there's less time, which has made me more effective. The old adage about the pram in the hall is pretty accurate but I've managed to organise time enough to get by. I'm always thinking about writing even when I'm not actually doing it, so that hasn't changed much. I like writing more than ever. If anything having a child has made me even more aware of the shortness of life, so it spurred me to try harder and go further to get done the stuff I really want to do right now and not put it off. 11. Correct me if I'm wrong, but you seem to be the pre-eminent lady of the New Weird in sf -- or at least one of its fastest rising stars. Do you think of yourself as part of this renaissance in British sf? Hmm. Not exactly. I'm just doing what I do and it's nice to be thought part of the best of the islands' efforts. Beyond getting questions like this I never give it a thought really. 12. Do you regard the New Weird label as a good thing in itself? Is it a genuinely regenerative force within the genre or merely a bit of harmless and unnecessary hype? It's a bit of harmless and necessary hype, I think. It came around at the peak of another one of those regular surges where SF and other genres swing close to each other's orbits for a while. There was and is a strong point to be made that within our genres everything is not the same and doesn't have the same goals. For marketing, sales and reviewing purposes the trade seem slow to catch onto this or find it hard to make a distinction that is easy to latch onto, so coming up with a name was a handy trick. It's difficult for authors who are non-trad in any genre to locate their audience and having a grouping of this kind is useful in the if-you-liked-this-you-might-like-that sense. It's a sales tool, it's not a theory of writing or anything. All the writers classed as New Weird are highly individual. They use all the core values of SF and F and H, but they aren't using trad format storylines and worldviews for the most part. They have exceptionally high literary skills. It's a taste, like sugar or salt. Like Weird? Try New Weird! 13. I like to ask everyone this because I know it's something I do, but do you write "to" music or at least with music on in the background? What is on the Robson stereo system at the moment? I use music to block out the rest of the world, in which case I don't even hear it, although subliminally I expect I do. I also use it to reinforce mood and to 'prime' myself to write certain kinds of things. I'm now listening to a playlist I made for writing the last novel. Thank god for playlists, no more albums (sorry music fans!). The current track is Pink -- Just Like A Pill. I got iTunes this week...oh boy! 14. You've said before that you're interested in aspects of Eastern philosophy, and given that you're a full-on yoga instructor, do you use yoga as an aid to writing at all? Yes. My experiences with yoga and its traditions vs. its effects are riddled all through most of my work, never more so than in the one I just finished -- Living Next Door To The God Of Love. But that book puts the lid on a whole cycle of my life, which was involved in this big philosophical and emotional struggle with Ought vs. Is; questioning every piece of handed-down dictatorly wisdom I've ever come across. Yoga's fun and it makes me feel better. 15. What's your favourite yoga position? And, on a not unrelated note (because I've been following the fascinating discussion on your board on the Third Alternative), do you have a favourite Zen koan? I've always liked Utthita Trikonasana -- the extended triangle (more info--www.yogajournal.com/poses/494_1.cfm), although any twists and backbends are all good. If I were better at it I think I might like handstand the best. I recently read a book by John Horgan, Rational Mysticism, in which he said that his personal mantra was the idiot's Duhh... and I go along with that. I don't have a favourite koan. I find them annoying. If I want to stop thinking and start noticing ... I don't know what I do exactly, but it doesn't seem that hard. Then you get stuck all in the moment and turn a bit odd...so it's horses for courses. 16. What is your conception of death, and are you afraid of it? It's the end of my life. No, I'm not afraid of being dead but I am afraid of a horrible lingering and painful end. 17. Would you like to live forever? No. Not without eternal youth and everyone else included, and even then I'd probably get bored. Human beings aren't the sort of stuff eternity is made of. But I would like to know what happens in the end. 18. When do you sit down to write? Do you have a Protestant work ethic that sees you in front of your computer from nine till five Monday to Friday churning out brilliant ideas or is it a more organic, fluid process? I write Monday and Wednesday for a couple of hours morning and afternoon, Tuesday and Wednesday evening, all Friday daytime unless skiving off and some of Saturday and Sunday. The wastage process of my writing is colossal, so even though I produce a lot of pages, I throw a lot out. 19. Without giving too much away, obviously, can you tell us what you've got planned for your next book or two? Any plans for a 10-part fantasy series, perhaps, or a trilogy of thousand-pagers about the Enlightenment? I am editing the next book at the moment. I don't know what to call it except Weird. After that I'm going back to write about the beginnings of the Forged in a more straightforward way. In odd minutes I've been writing an elf/cyborg fantasy for fun, which is riddled with every cliché--no plotline too unlikely, no twist too stupid; anything goes. It makes me laugh. I don't know if I'll do anything with that but it's been a good exercise for freeing up some tired imagining muscles. 20. What would you rather eat -- some rather good chocolate or a well-prepared salad? Depends entirely on the circumstances. 21. What's your favourite alcoholic drink? Champagne. Or, to be more accurate here, Cava. 22. A friend asks--who was your favourite character from The Muppet Show? In fact, which was better, The Muppet Show or Sesame Street? The Muppet Show. Miss Piggy. 23. What items would you bury in a time capsule now to try and convey to our descendants what life was like in the early 21st century? An MP3 player loaded with an all-chart snapshot. A mobile phone. A latte from Starbucks. A bank statement. A stuffed Disney Winnie the Pooh. The Bible. The Koran. An anti-personnel mine. A bag of plastic supermarket bags and packaging. A copy of The Face. A copy of Take A Break. A Kalashnikov. A self-help book. A breakdown of each nation's spending habits, debts and deaths. That Nigerian spam letter. On second thoughts. They'll have their own problems and if they can't figure it out from all the dross we're leaving behind anyway why should I add to that? I'd bury a case of scotch, a copy of Private Eye and a Martian Popping Thing. Justina Robson, thank you very much indeed. Justina Robson's novels are published in the UK by Macmillan/Tor UK. ...books by Justina Robson from Amazon.com or Amazon.co.uk. non-fiction - reviews of Justina Robson's work; more non-fiction by Stuart Carter. Justina Robson at Amazon.com / Amazon.co.uk. Pan Macmillan, Justina's UK publishers.